What’s the deal with Ignatian yoga? A skeptical Jesuit finds out. “Ignatian yoga,” a new entity that is drawing enthusiastic crowds to retreats and workshops across the country, sounds like a gimmick. People love yoga. People love the spirituality of St. Ignatius Loyola. Mash the two together, and you have created a nice, marketable concept that can sweep a bundle of folks into the arms of the Lord and/or the Society of Jesus. A Jesuit yoga teacher in a cobalt blue T-shirt (“IHS” nestled in the middle of a lotus flower) guides students through Christian spirituality and then mesmerizes them with yoga poses. They do this in a church sanctuary, rubber mats spread on marble floors. It seems perfect for a world in which anything can become anything, in which all spiritualities and traditions are completely fluid and can bleed into each other with little self-awareness or sense of fundamental boundaries. It seems perfect because the Catholic faith is spiritual and yoga is spiritual and both have to do with people and people are good and they have souls and a corner of a good person’s soul touches Jesus and another corner of the soul brushes against yoga because yoga exists, and thus Jesus and Patanjali, Francis Xavier and Swami Vivekananda, Rome and Delhi, the empty tomb and the emptying of desire are essentially in some broader cosmic sense part of, if not the same thing. Why make distinctions between the two when to distinguish is to deny, to exclude, to create harsh boundaries? And so yoga and Christian spirituality can be in some ways two co-equal wings of the same Creator and his entire recommended path of living, and so it all works out. It all works out. Time for final savasana. The practice of Ignatian yoga in the United States began in 2013 at Fordham University with a Jesuit scholastic named Bobby Karle. A certified yoga instructor, Karle began offering sessions in yoga framed by Jesuit principles before weeknight liturgies at the campus church. By 2017, Ignatian yoga had taken shape as an established organization. Karle and his teaching partner, Alan Haras, have held workshops and retreats in Hollywood, Detroit, Milford, Ohio, Worcester, Mass., Boston, New York, Cleveland and even Australia. “Ignatian yoga,” a new entity that is drawing enthusiastic crowds to retreats and workshops across the country, sounds like a gimmick. Last year, I gave a talk and led a chapel meditation at one of these Ignatian yoga retreats. It took place at a retreat center about an hour north of Manhattan. I had never attended an Ignatian yoga event, and I admit, even though I was one of the speakers, I was a bit skeptical of the whole thing. In contradistinction to the above litany of modern spirituality, it seemed that with “Ignatian yoga” you could end up with either a corruption of yoga or a corruption of Catholic spirituality. Yoga is plucked from its roots in the Rig Veda and various Indian philosophies and elsewhere (it has a complicated lineage) and lashed onto the altar of Christ. Yoga undergoes the old, sly Christian gimmick of retrofitting pagan rites and festivals for the worship of Jesus (see: Easter, Christmas, the Super Bowl, kind of). Or, inversely, Christian spirituality is attached like a barnacle to a segment of pop culture to draw in more converts, like staging a prayer meeting in the parking lot of an Ariana Grande concert, and Christianity somehow becomes lesser. Further, members of the Society of Jesus are used to having “Ignatian” or “Jesuit” strung like a verbal sling around any number of spiritual or educational things that Catholics run to lend them a sort of mystical legitimacy or “brand recognition.” The more quickly an institution founded by Jesuits is renamed to include the term “Jesuit,” for instance, the more certainly that institution has lost most of its Jesuits. If Duluth Prep suddenly becomes Duluth Jesuit Prep, it means there are now between one and zero Jesuits at the school. But back to the actual yoga. Consider this: Most American yoga is actually workout yoga. It does not involve Americans—80 percent of whom are in one fashion or another Christian—making limber supplication to pagan gods. Contrary to the warnings of some church leaders, the practice of yoga is not tantamount to a kind of physical heresy. American gym yoga is mainly done by people who want to get fit, work out kinks, do some cardio, meet guys, find some inner calm, strengthen muscles, get centered, shed pounds, meet women—the usual reasons people go to gyms. For a Christian, the rituals of yoga are not by any stretch a substitute for the rituals of the paschal mystery of Christ. Yoga in this country is not overflowing with people who read Sanskrit, attend all kinds of profoundly impacting yoga retreats or meditate deeply on Vedic spirituality. Sure, some people are into that. And in most yoga classes, you are encouraged by teachers with yoga advice that can sometimes meld into life advice. You may hear a quote at the end of the session, sometimes by a yogi, sometimes by someone like Mother Teresa or Marianne Williamson. And God bless, it is helpful and meaningful. But for a Christian, the rituals of yoga are not by any stretch a substitute for the rituals of the paschal mystery of Christ. 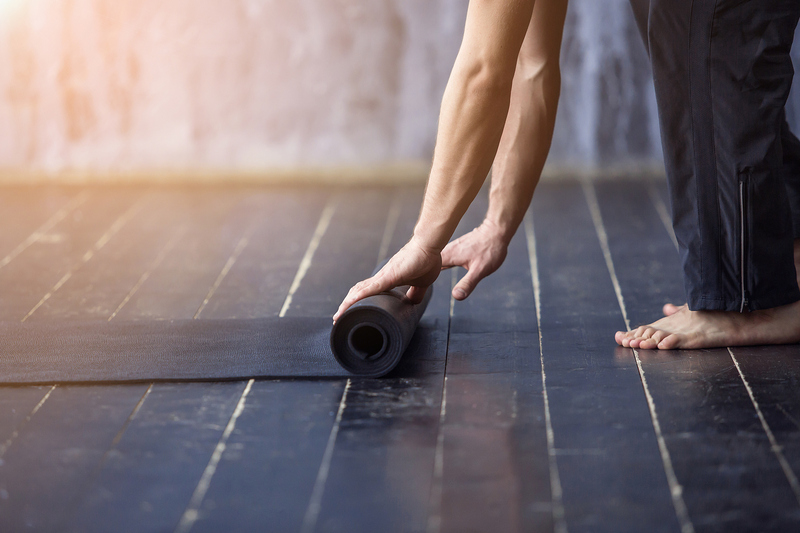 At the same time, no matter how gym-ish it is and whether or not the yoga teacher says anything vaguely denominational at all, yoga is always a spiritual practice. But how? Because it is a slow workout. And when you are doing something slowly, you have more time to notice what you are doing. And one of the first things you notice when you slowly start to do slow American gym yoga is you that you have a body. You have a body, and this body is doing things on a rubber mat, on a wood floor, flanked by mirrors and ballet barres, and surrounded by two dozen insanely good-looking 25-year-olds. And yoga can do the same, regardless of whether you are looking for it or not. You can feel a great spirit moving within. And Catholics name that spirit God and name Christ God incarnate. At the retreat I attended, Karle and Haras began sessions with a talk on the fundamentals of Ignatian spirituality and the principles of yoga and how these two traditions can benefit one another. They then led the retreatants through the asanas (yoga poses). Following the asanas, while the students rested on their mats, Karle and Haras led them through a guided Ignatian meditation. You can connect yoga and Christianity without literally bringing them together around the table of the holy and perfect sacrifice of Christ. The point of the retreat was not to fabricate some awkward blend of the two spiritualities, to create a room full of half-yogi, half-Catholic centaurs. Karle describes Ignatian yoga as a vehicle for calming and centering a person, so he or she is able to receive more fully the Christian spirituality on offer. In Ignatian yoga, unlike many current trends in spirituality, distinctions actually are made. The retreat offered Mass and confession but without any horrifying syncretism. We did not celebrate the liturgy while flowing through vinyasa poses; the priest did not intone “Namaste” instead of “Body of Christ” while distributing Communion. Mass was Mass, in a chapel, with the regular prayers, and confession was confession. During the retreat, while leading the yoga classes, Karle and Haras came off as very normal and funny but without trying to be normal and funny in that cloying way that some teachers do. They had no schtick. They bore authority but not smugness. Smug is the death of religion. Smugness in a spiritual leader asphyxiates everything she is trying to do: “I have God figured out and even you, seeker, with your questions and mistakes, are worthy of my amused smile and gentle, pitying instruction.” Karle and Haras put people at ease by their energy and bearing. The two leaders were calm and peaceful but not—and this is hard to describe or convey exactly—not in the typical yoga-teacher way. What is more, they had long hair, but somehow they did not have long hair in a cool way. They were from Detroit. Haras, in fact, had just this side of a mullet. And Bobby Karle is possibly the last non-ironic Jesuit living outside a novitiate in the entire United States. He is just a ridiculously great guy. So my experience of Ignatian yoga was, all in all, Detroit, uncool, Catholic, noncondescending, un-ironic, anti-yoga teacher, meditative, non-syncretic, lovely yoga. It was hard not to like it. I have been practicing yoga and Ignatian Spirituality for 25 years, it never had a name before. Great article thank you. Nearly thirty years ago I read a book referencing The Yoga of the Jesuits as postures adopted in parts of the Office and in Retreat that were thought to reflect a (Xaverian ?) knowledge acquired through contact with other spiritual traditions in India and further east. It may have been wishful thinking projected by the author, but it left me intrigued, not least because I wondered how it was that, after seven years in a SJ college, neither I nor my friends had picked up even a whisper of such a thing ? I ascribed the notion to the widespread urban myths that follow the Society, although secretiveness was indeed the directing characteristic of the need-to-know rationing at work in my schools ! Nice article, thanks -- in my mind, the asanas (like anything done with intention) can help quiet our minds so we can be more attuned to the presence and action of God in us. I always enjoy reading articles like this although, as always, Grasshoppa, one must strive through deep meditation and the cosmic connection with all other religions to discover the self-evident truth: "...flanked by mirrors and ballet barres, and surrounded by two dozen insanely good-looking 25-year-olds."... Nuff said or "...if you immediately know the candlelight is fire, then the meal was cooked a long time ago."... Time to go for a long walk but, darn, where ARE the mirrors? I have never been in a yoga studio that had either mirrors or ballet barres, only ballet studios. The Yoga studios have NO mirrors much less barres. I never took Bikram Hot Yoga maybe those studios have those things. How about Jesuits hotboxing.? Namaste. I also do Indian yoga and it is a very pleasant experience. I was advised by a driving instructor. I was too caught up in driving lessons , usually it goes through a couple of classes, but not in my case. I tried yoga and yay, it worked. Now I can compete with Schumacher. Thanks to the driving school for an individual approach to each student, a unique system and for my skills!